When you think of the word “adventure,” what comes to mind? Do you imagine sweeping stretches of highway, a full fuel tank, and all the time in the world? Or maybe you’d prefer an off-road excursion, exploring sights few other drivers will ever get to see from the seat of luxury and elegance. Most of all, adventure means stepping out of your comfort zone and leaving “that’s impossible” in the rearview mirror. If you’re ready to get out there and discover everything this big, beautiful country has to offer, choose the Range Rover Evoque. Searching for a Range Rover Evoque near Brampton? Visit the dealership that’s completely dedicated to you. Welcome to Land Rover Toronto. At Land Rover Toronto, we’re proud to maintain an incredible inventory of Range Rover Evoque models, each equipped with the cool features and convenient technology that make every trip memorable. Our expert team is completely committed to your satisfaction, which is why we’re always striving to find new ways of going above and beyond. Visit us today, and discover why we’re the very best place to find a Range Rover Evoque near Brampton. You can find us at 777 Dundas Street E in Toronto, ON, or feel free to give us a call at 416-530-1880. We always strive to provide a Land Rover dealership experience that goes beyond your expectations. Visit us near Brampton today! The Range Rover Evoque incorporates a lot of functionality into a compact design. In fact, it might just convince you that the “V” in SUV stands for versatility. The Evoque’s five-door design makes accessing every square centimetre of the cargo area easy and convenient. Whether you’re heading out to a sports event, taking a road trip, or loading luggage on your way to the airport, the Evoque offers plenty of stylishly-appointed storage. Always be prepared, in the Range Rover Evoque. Sunshine and longer days are here, which means it’s time to put the top down and feel the wind in your hair. 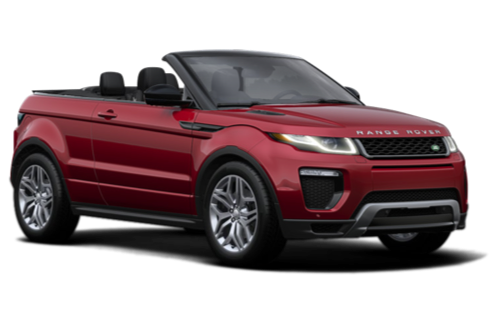 Enjoy the best of both worlds, with the Range Rover Evoque convertible edition. You’ll get the stunning capability that Land Rover is famous for, in addition to the fun and freedom that comes with putting the top down and really enjoying the scenery. The distinctive styling of the Range Rover Evoque Convertible makes it a true standout among its parking lot peers. Who says you can’t have it all? Thanks to a host of intelligent technology, the Range Rover Evoque lets you stay connected to the content that matters most to you. Keep your favourite apps, maps, and music right at your fingertips with the Touch or TouchPro system, and use InControl Apps to control a carefully curated home screen interface. Integration is simple and seamless, which makes it easy to keep in touch with the world outside of your Evoque. Stay InControl of your experience in the Range Rover Evoque. A legendary SUV needs a legendary powertrain to drive it. At the heart of every Range Rover Evoque, a 2.0L turbocharged engine spins out a street-scorching 237 horsepower. Want even more get up and go? Choose the 286 horsepower option, and discover what it feels like to put the joy back into your ride. A 9 speed automatic transmission fuels the performance of this powerhouse, and delivers the signature high performance and efficiency that Land Rover is known for. Experience a first-class way to travel in the Range Rover Evoque.